Biennials or perennials; (short-lived, caudex thickened, usually simple, rarely branched). Trichomes of leaves 2- or 3-rayed. 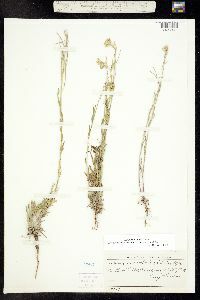 Stems erect, unbranched or branched distally, 1.5-7 dm. Basal leaves: blade linear to linear-oblanceolate, 1.5-6(-8) cm × 2-8 mm, base attenuate, margins entire or dentate, apex acute. Cauline leaves (distal) sessile; blade margins entire or denticulate. Racemes elongated or not in fruit. Fruiting pedicels divaricate-ascending to ascending, stout, slightly narrower than fruit, 4-9(-15) mm. Flowers: sepals oblong to linear-oblong, 4-6 mm, lateral pair slightly saccate basally; petals yellow, oblanceolate, 6-9 (-11) × 1-2 mm, claw 5-7 mm, apex rounded; median filaments 5-7 mm; anthers narrowly oblong to linear, 1-2 mm. 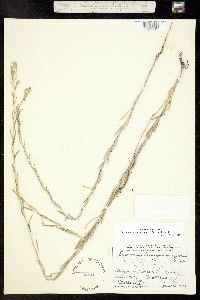 Fruits ascending to divaricate-ascending, (not appressed to rachis), narrowly linear, straight, not torulose, 3-5.8(-7) cm × 1-1.5(-1.8) mm, slightly 4-angled or terete, not striped; valves with somewhat prominent midvein, pubescent outside, trichomes 2-4-rayed, glabrous inside; ovules 36-66 per ovary; style cylindrical, stout, 0.7-3 mm, moderately to sparsely pubescent; stigma strongly 2-lobed, lobes as long as wide. Seeds ovoid, 1.2-1.7 × 0.8-1 mm; not winged or wing apiculate. 2n = 81. Flowering Apr-Aug. Calcareous talus and cliffs, roadsides, railroad embankments, abandoned fields, hillsides, alkaline ground, bluffs, crevices and ledges, gravel, prairies, rocky pastures, among brush, waste sites; 100-2700 m; Alta., B.C., Man., N.S., Ont., Que., Sask., Yukon; Alaska, Ark., Colo., Idaho, Ill., Ind., Kans., Maine, Mich., Minn., Mo., Mont., Nev., N.H., N.Y., N.Dak., Ohio, Okla., Oreg., S.Dak., Utah, Wis., Wyo. Erysimum inconspicuum is known in Yukon from Raup & Correll 11255 (A), which was collected 7 miles east of Little Atlin Lake, and Malte s.n. 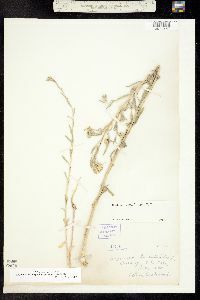 (GH), which was collected from Dawson on 10 August 1916. 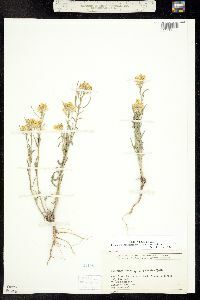 Most of the other collections from Yukon identified as E. inconspicuum belong to E. coarctatum. The record from Quebec is based on Cayouette J80-8 (GH), from Cté de Charlevoix, and Victorin, Germain, & Meilleur 43128 (GH), from Du Lac-Saint-Jean. Perennial herb 30 cm - 0.8 m tall Stem: upright, usually unbranched, grayish green, very hairy. Leaves: alternate, usually upright or ascending, grayish green, linear to oblong, mostly non-toothed. The upper leaf surface is covered with a mix of two-pronged and three-pronged hairs. 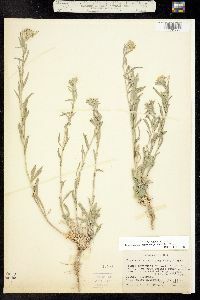 The upper leaves are rarely over 5 mm wide. Flowers: in a long, branched cluster (raceme). Stalks ascending, 3 - 9 mm long, stout. Sepals four, 4.5 - 7 mm long, densely hairy. Petals four, pale yellow, 6 - 10 mm long. Stamens six. Fruit: a long, narrow pod, upright or nearly so, 1.5 - 4 cm long, four-angled, and hairy. Seeds in one row. 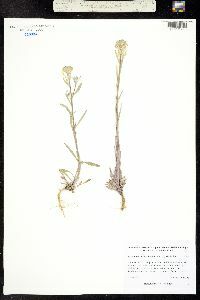 Similar species: The similar Erysimum cheiranthoides differs by having petals that do not typically exceed 5 mm long, sepals that do not typically exceed 3.5 mm long, and fruit that does not typically exceed 3 cm long. Erysimum hieraciifolium differs by having leaves with four-pronged hairs on the upper surface and toothed margins. Erysimum repandum, which is a pale green annual, typically has fruit more than 5 cm long. Habitat and ecology: Introduced from farther west of the Chicago Region. Local along railroads and in other disturbed areas. Look for it in both sandy and gravelly soils, especially on dry sites. Etymology: Erysimum comes from the Greek word eryomai, meaning "to help or save," which refers to the medicinal qualities of some species. Inconspicuum means inconspicuous.